Joseph Pulitzer established the famous prize that bears his name in his will, and the award was first given in 1917, six years after his death. While only four prizes were given initially - two in journalism and two in letters, drama, and music - there are 21 Pulitzer categories today. 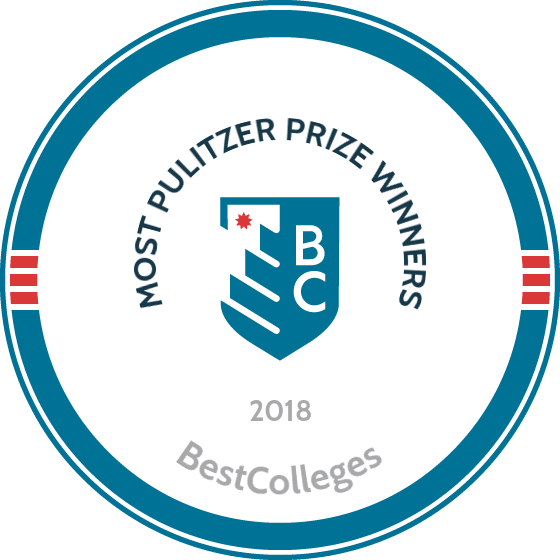 Columbia University administers the prize, though finalists and winners are selected by the independent Pulitzer Board. Several of the categories are collaborative and involve traditional-style newsroom journalism, where multiple writers and editors work together on an important story and share the Prize. Others, like political cartooning, have only been awarded to individuals. For this list, all winners are counted in cases where several people share one award. Additionally, different undergraduate and graduate schools may each claim the same winner, so each is given credit for a win. For example, Thornton Wilder, a three-time Pulitzer winner, attended Yale as an undergraduate and Princeton for his master's. On our list, each school is credited with three wins. In the case of ties, schools are listed alphabetically. Many schools list faculty who have won Pulitzers; our list reflects only the schools that winners attended. Harvard holds a considerable lead with 124 Pulitzer winners. Henry Adams, who graduated from Harvard in 1858, won a Pulitzer in 1919 for his autobiography. In 1965, Ernest Samuels won the Pulitzer for his three-volume biography of Henry Adams, a rare instance of one Pulitzer winner serving as the subject of another winner's work. Other well-known winners from Harvard include novelist James Agee (winner in 1958), historian Doris Kearns Goodwin (1995), and President John F. Kennedy (1957). David A. Fahrenthold, a Harvard graduate, received a Pulitzer Prize in 2017 for his journalistic work covering national politics for The Washington Post. Though he never attended college himself, Joseph Pulitzer bequeathed $2 million to Columbia University to found the world's first journalism school-- the Columbia University Graduate School of Journalism. Several years later, Columbia began administering the Pulitzer Prize awards. Famous winners from Columbia include novelists Upton Sinclair (1943) and Eudora Welty (1973) and playwright Tony Kushner (1993). Graduates from Northwestern's Medill School of Journalism have done well, especially in their hometown. Jack Fuller won in 1986 for his editorials on constitutional issues published in the Chicago Tribune. Fran Main of the Chicago Sun-Times won the 2011 Pulitzer Prize for Local Reporting for his coverage of violence in Chicago neighborhoods. Lois Wille of the Chicago Tribune was a finalist in Editorial Writing in 1984 and a winner in 1989 for her editorials on a variety of local issues. Famous writers Thornton Wilder (1928) and Stephen Vincent Benet (1929) were Yale's first winners, and as recently as 2012, three Yale alumni won Pulitzers in the same year. Both Wilder (1938, 1943) and Benet (1944) won multiple awards. Historian David McCullough also won two Pulitzers for presidential biographies, for Truman in 1993 and John Adams in 2002. Michigan's first Pulitzer was awarded in the History category in 1930 to Claude H. Van Tyne for his work The War of Independence. The school's latest came in Music in 2015 for the oratorio Anthracite Fields by Julia Wolfe. In between, Michigan had famous winners like playwright Arthur Miller, who won for Death of a Salesman (1949), and poet Theodore Roethke (1954). Photojournalist Michel duCille won three Pulitzers after graduating from Indiana, two in photography categories (1986, 1988) and one in Public Service (2008). Like many other Pulitzer winners, he subsequently served on the Pulitzer Board. 1950 graduate Gene Miller won two Pulitzers (1967, 1976) for his reporting in the Miami Herald. Indiana's best-known winners are Ernie Pyle, the war correspondent who won in 1944, and poet Gary Snyder (1975). 1938 Iowa graduate Tennessee Williams won two Drama Pulitzers for his plays, the first in 1948 for A Streetcar Named Desire, and the second in 1955 for Cat on A Hot Tin Roof. Paul Conrad won three Pulitzers for Editorial Cartooning (1964, 1971, 1983). 2008 was a good year for Iowa, with two alumni winners David Lang (Music) and Philip Schultz (Poetry) along with a second winner in Poetry, visiting faculty member Robert Haas. Princeton, like Harvard, has a Pulitzer winner who himself was the subject of a Pulitzer-winning biography. George F. Kennan, who won for history in 1957 and for his Memoirs in 1968, was the subject of John Lewis Gaddis's 2012 Pulitzer-winning biography. Princeton also has several other multiple Pulitzer winners including Thornton Wilder, novelist Booth Tarkington (1919, 1922), and journalist Arthur Krock (1935, 1938) who may have joined the exclusive three-time winner club in 1951, had he not been on the Pulitzer Board then. Playwright Eugene O'Neill, who attended Princeton for a year before dropping out, won four Pulitzers (1920, 1922, 1928, 1957). The Yearling, the poignant story of a boy who adopts an orphaned fawn, won the Pulitzer in 1939 for author Marjorie Kinnan Rawlings, who graduated from Wisconsin with an English degree in 1918. Esther Forbes, who attended Wisconsin at the same time as Rawlings, wrote several novels before switching to biographies. She won the Pulitzer Prize for History in 1943 for her work on Paul Revere. Allan Nevins won two early Pulitzers in Biography (1933, 1937). Historian David Herbert Donald won two Pulitzers in Biography as well (1961, 1988). In his career as film critic for the Chicago Sun-Times, Roger Ebert won the first Pulitzer awarded for Criticism in 1975.